What do we need to rollout an ASP.NET website to a windows docker container? 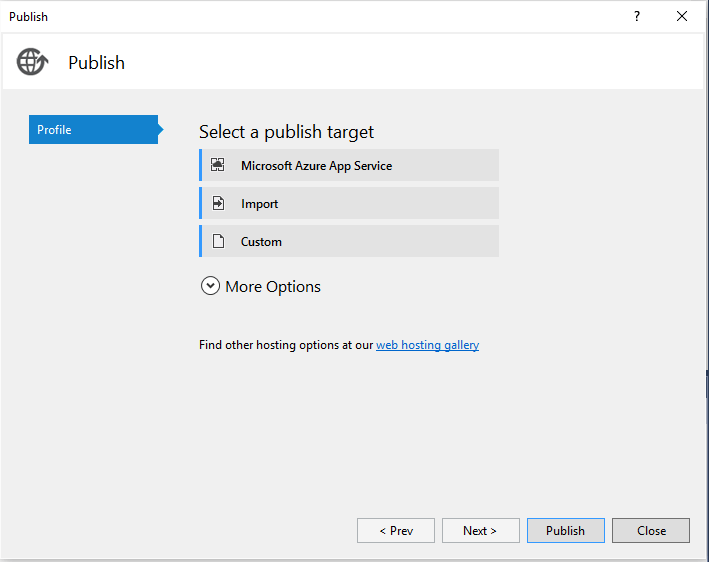 I personally love to use web deploy to deploy the website after build, so it can be done exactly the same way as you would deploy to Azure App Services or your local IIS Server on any server you already know and love. The command tells docker to build an image, give it the tag windowsserveriis and use the current folder (denoted with the dot) as the context to build the image. this means that everything stated in the dockerfile is relative to that context. Note that you are only allowed to use lowercase characters for the tagename. Now we have an image that is capable of running an ASP.NET application. The next step is that we need webdepoy to be installed in the container. For this we need to download the installer for webdeploy and then issue an command that will install and wait for the installation to finish. We first download the installer in the same folder as the dockerfile and then we will add it to the image. In the following steps I assume you already downloaded the MSI (WebDeploy_2_10_amd64_en-US.msi) and have it in the same folder as the dockerfile. When installing the msi we will use msiexec and need to start a process that we can wait on to be done. If we would only run msiexec, then this command returns and runs in the background, making the container to exit, leaving us in an undefined state. Note that we are using powershell start-process with the –wait option, so we wait for the installation to finish, before we commit the new layer. Now we have an image that is capable to host our website in IIS and use webdeploy to install our website. In the previous steps we created a new docker file for each step. But it is probably better to do this in one file, batching all commands together leaving you with the same endstate. We can also optimize the process a bit, since Microsoft already provides an image called microsoft/iis that has the iis feature enabled. 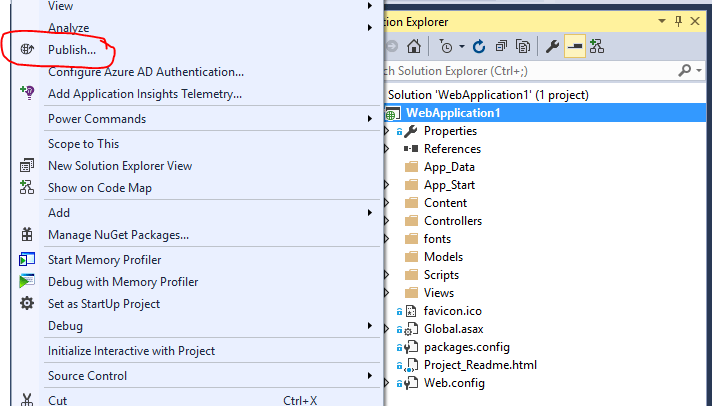 This means we can use that image as the base layer and skip the install of IIS. Now again we run the docker build command to get the docker image capable of running our website and use the webdeploy packages that can be produced by a standard ASP.NET build procedure. The final step is to deploy your webdeploy package to the image. Now before we can deploy our website we need to get the webdeploy package. 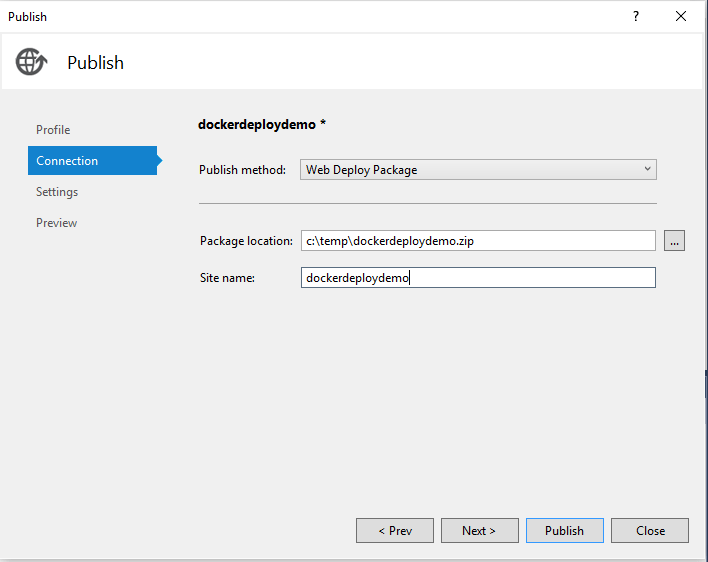 Now that we have the webdeploy package and the accompanying deployment artifacts, we can again create a docker file that will then upload the package to the container and install the website in the container. This will then leave you with a complete docker image that runs your website. This now finally results in our web application in a container that we can then run on any windows server that has windows containers enabled. Now we can browse to the website. Be aware that you can only reach the container from the outside, so if you would browse to localhost, which results in the 127.0.0.0 you will not see any results. You need to address your machine on its actual hostname or outside IP address. To summarize what we have done, we first created a docker image capable of running IIS, then we added ASP.NET 4.5, then we added webdeploy and finally we deployed our website to the container using webdeploy and the package generated by Visual Studio. In the next post I will show you how we can use this image in build and release management using VSTS and then deploy the container to a server so we can run automated tests as a stage in the delivery pipeline. Thanks for this guide. I tried it on Windows Server 2016. I needed to use “Default Web Site/dockerdeploydemo” as my site name when publishing otherwise web deploy gives me Error Code: ERROR_SITE_DOES_NOT_EXIST. Error: This access control list is not in canonical form and therefore cannot be modified. Hi, thank you for your post. I have the same issue as Julian mentioned, “Error: This access control list is not in canonical form and therefore cannot be modified.”, and couldn’t find your fix, any suggestion? Is there any reason for this choice ? So what can be the resolution? Are you running the command prompt in admin mode? 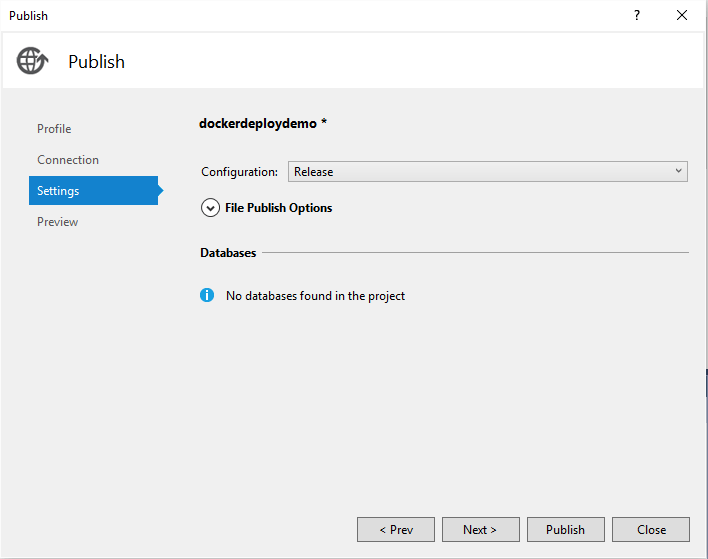 docker build –t windowsserveriisaspnet . Type in command manually, do not copy-paste it. was this Error Code: ERROR_SITE_DOES_NOT_EXIST resolved? GetFileAttributesEx WebDeploy_2_10_amd64_en-US.msi: The system cannot find the file specified. Hi Marcel, I have identified the issue, I was used wrong IP address…now I’m able to see IIS home page..
docker inspect will show the IP address which is assigned to the container. I am new to Docker. Would it be possible to run ASP.NET 4.5 or 5 on a Windows Container where the Docker Host is Mac? nope, your docker container must match the operating system, since a container is operating system virtualization. that means the kernel is shared with the host and therefore you can not run windows containers on unix/Linux/mac systems. At the moment you also can’t run Linux based containers on windows, although Microsoft has announced to support Linux containers on their platform using hyper-v containers. but again it failed with unrecognized command. Can you please or anybody here help? Thank you guys. By the way really awesome that you took time writing something for Docker and .Net 4.5. So thank you. I am using Windows 10, with Docker version 17.09.0-ce-win33 (13620). I couldn’t get the fix for ACL working. After the first ACL error, the build exited with return code equals 1. So, the fix ACL.ps1 couldn’t be executed. So far so good. But when I browse to http://192.168.43.141 from the local machine, the chrome browser returned “This site can’t be reached”. Do you know if I have missed any step? I am new to Docker. Where should I store the Dockerfile? Do I run the Dockerfile in PowerShell? 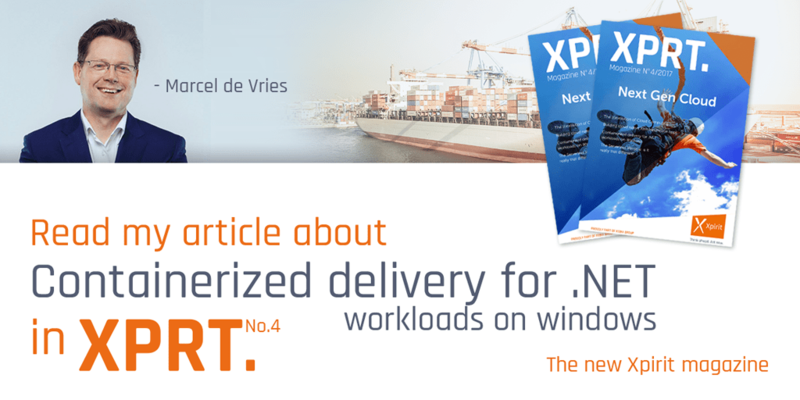 Based on this article I was trying to deploy ASP.NET 4.5 application using Docker for Windows. I have done everthing and I have checked container IP using docker inspect Container_ID. I’ve put this IP to my browser and it opens only default IIS page. So it seems that IIS server works, but how am I suppouse to open my application? http://172.30.169.6 and http://172.30.169.6:80 – both of them displaying default IIS site. Perhaps you deploy to a sub folder and you need to add that to the url?